Scredington, 4 miles S by East of Sleaford is a pleasant village and parish, with a railway station on the Bourn and Sleaford branch of the Great Northern Railway. It contains 304 souls and 2530 acres of land watered by a small rivulet and including a district of scattered farms, called Gorse Hill, one mile S West., and the hamlet of North beck, half a mile North of the village. The soil belongs chiefly to James Girdwood Esq, the Rev E S Berry, the Dean and Chapter of Lincoln, Morcatt Hospital, and to the Clarke, Kelham and Rippon families. The church, having become very dilapidated, was restored in 1869 through the zealous exertions of the present incumbent at a cost of about £1000, raised by subscription. It is a small but pretty stone fabric consisting of nave, chancel, north aisle, south porch and a tower and spire, with two ancient bells. In the aisle is a niche containing a recumbent effigy in stone of a former vicar, represented in Eucharistic vestments; and at the west end of the church is a handsome antique tomb of William Paulet, who died in 1464. The living is a vicarage, valued in K B at £6-15s-4d, and now at £200, in the patronage of the Dean and Chapter of Lincoln [the appropriators] and incumbency of the Rev Edward Sterling Berry M A of sleaford. There is no vicarage house, but it is proposed to erect one as soon as funds are obtained. At the enclosure in 1798, 313 acres was allotted to the rectory, and 132 acres to the vicarage, in lieu of tithes. The Poor's Allotment awarded at the same time is 19 acres, let to a number of cottagers, at rents amounting to about £30 per annum, which is distributed in coals. the poor parishioners have also the interest of £50 left by an unknown donor. In a field where there was formerly a lake or mere, is a Romas milestone, now called the mere stone. here is a small Wesleyan Chapel, built in 1840. The Thorny Close moat is adjacent, although now on the opposite side of the road from, a manor house in the hamlet of Northbeck across the stream from the village of Scredington (Fig 76 ). Situated on flat land slightly above 7.5 m OD, it is rectangular in form and encloses an area of some 2,500 sq. metres. From the north-west corner a 30 metre long arm leads off due west, possibly indicating a further enclosure now filled in. Along the entire length of the northern edge of the moat is a substantial outer bank (Fig 77). The site can presumably be identified as manorial. However, its origins and tenurial context are difficult to elucidate, for the moat is one of five that survived into the present century in a vill which is characterised by a bewilderingly complex estate structure in the Middle Ages. In 1086 there were only two parcels of land. Robert of Stafford is said to have held a manor of twelve carucates, but it seems that this was a mistake for bovates, for the appurtenances of the estate were modest; its assessment in ploughlands was measured in oxen rather than teams; and the fee was taxed at one carucate and four bovates in the thirteenth century (1). It was held by a tenant Gulfered at the time of Domesday Book, but few details of its later history have survived for it was not held by military service. The rest of the vill, some ten carucates and four bovates of land, was sokeland of Folkingham and belonged to Gilbert de Gant in 1086 (2). By the thirteenth century part of this fee was held of the honour of Gant in two parcels by the Hauteyn family, and they granted land therefrom to the abbots of Dereham, Bourne, and Sempringham, and the church and glebe to the Dean and Chapter of Lincoln. In the fourteenth century the Hauteyn estate was further divided (3). Of the remainder of the fee, Oliver de Vas held a portion in the early thirteenth century, but the bulk was parcel of the honour of Craon and was held by the Hauteyn, Latimer, and Mareham families. Further interests subsequently emerged, but are poorly documented (4). From the mid fourteenth century the military tenements began to resolve themselves into a simpler estate structure. The various abbeys still held their separate estates, but William Latimer seems to have acquired the Gant fee, which he held of William Disney, and probably retained his interest in the Craon estate. The whole passed to the Pilates who appear to have been the principal landholders in the fifteenth century (5). However, there may have been many other substantial freeholders who, holding by rents, do not appear in the public records. The Pilate family, for example, does not appear in scutage accounts and IPM's until 1389, but a Gilbert Pilate witnesses a Scredington charter as early as c.1190, and it must be assumed that his descendants were of some importance in the vill throughout the Middle Ages (6). There may have been many such tenants, who, like William in Winkhill in the late twelfth century (7), were the descendants of sokemen whose tenements became the nucleus of manors held by non-military services. Relating such a complex manorial history to the surviving sites is extremely difficult. Only three references have been found to residences - the Dean and Chapter maintained a rectory manor, which seems to have been situated in the vicinity of the old vicarage, in c.1300, while Ralf Pilate's house lay to the south on the 'High Street', and Simon de Mareham had a capital messuage which has not been located (8) - but none can be equated with any of the moated sites. As the most substantial, the complex in Hall Close can probably be identified as the remains of the Hauteyn and Latimer manor, although it also includes streets and house platforms. But beyond this, despite considerable archaeological evidence for occupation between 1350 and 1450 on one site (9), the moats south of the Beck reveal nothing of their origins and nature. Equally no concrete evidence has come to light to identify the Thorny Close moat. However, it may be significant that there were two fees in 1086 and subsequently two settlement nuclei. 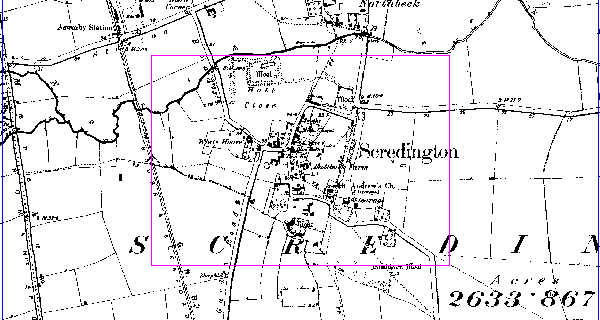 The Gant fee was probably substantially in Scredington, for the advowson of the church belonged to the estate, and so it is possible that the Stafford fee, largely unnoticed in medieval sources, had its nucleus in Northbeck. The manorial complex would therefore relate to this fee. 1. Lincs DB, 59/16; BF, 1033. 3. BF, 179, 1033; RH i, 241b; RA, nos 2101, 2102, 2103; FA iii, 129, 194. 4. BF, 179, 1033; FA iii, 162, 209. Oliver de Vas may have held of the honour of Craon, possibly as a mesne tenant. See BF 195. 5, CI vii, 477; CI xv, 156, 394; CI xvi, 279. 8. RA no 2105; 'Charters Relating to the Priory of Sempringham', ed. E. M. Poynton, The Genealogist, new ser. 15, (1899), 40. 9. L. A. S. Butler, 'Hambleton Moat, Scredington Lincolnshire', JBAA 3rd ser. 26, 1963, 51-7.